Welcome to Imperfectly Painted newest feature, Imperfectly You! I've have been so inspired by your responses to my Talk it Out Tuesday posts and my recent bullying post that I wanted to do more with Imperfectly Painted. I know many of us struggle with self esteem and insecurities. I have found that one of the best ways to gain positivity and strength is through sharing and being open about our experiences. I want Imperfectly You to be that for my readers. This will be either a monthly or twice a month feature where I will feature a nail polish that has name that I think reflects a topic/theme that I feel is important to us as women as far as self esteem building. I will then share my experiences with this topic, and the comment section will be open to you all reflect on your experiences. I want to create a positive and supportive space for all of us, and of course connect it to our love of nail polish. We are all imperfect people, but you know what? That is OK, and we are enough just the way we are. 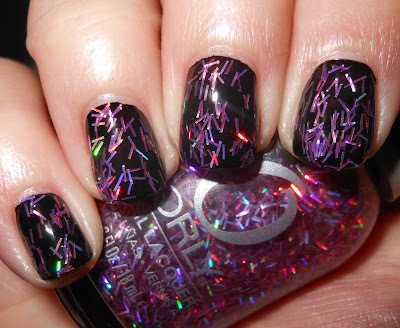 Today's Topic: Being Brave/Bravery, inspired by Orly Glam FX Be Brave polish. I think a lot of times we sell ourselves short. It's hard in our lives when we are under a lot of stress or pressure to give ourselves credit. We often feel weak or inadequate when our world does not go the way we expect or want it to. This is simply not true, a lot of things we do in our life are not easy, and we have to be brave to take certain actions or deal with certain emotions. These acts of bravery no matter how small or how big should never get swept under the rug. I lack the ability a lot of the time to recognize my own bravery. I often find that other people tell me my moments of bravery. Sadly, in the past I would dismiss this, and just say it's not a big deal. Now, I'm learning to appreciate my moments of bravery and recognize their worth. One of my bravest moments was probably picking up and moving from Dallas, TX to Orlando, FL at 20..alone. I didn't have any friends or family here, but I knew I needed to get away from home. Home was toxic to me, and while my parents were nothing but loving, my hometown was full of painful memories and reminders of a life I wanted to leave behind. So, I left. I never realized what a bold move that was until so many people approached me and said they could never move away alone like I did. I consider myself an overly cautious person. I don't ride roller coasters or any ride that isn't meant for 3 year olds for that matter. Flying makes me nervous. I check to make sure the door is locked 923598 before I go to sleep, but I never thought moving almost 1,200 miles away from home wasn't anything to make a fuss about? Crazy. I used to be so hard on myself for not feeling like I'm living up to par with my childhood peers. I ventured into a new city alone. That's not easy! It wasn't easy, and now I try to remember to pat myself on the back about my bravery in regards to this. Where in your life have you been brave? Please share your experiences with being brave in the comments below. Hi Steph, This is so creative ! You are just great! 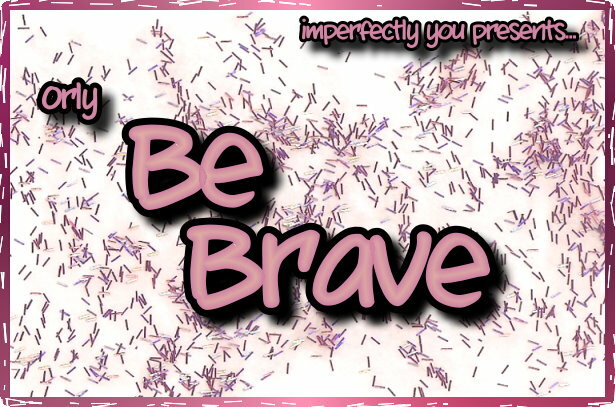 You are super brave, and I love that you have started with this polish for your Imperfectly You series. It takes "guts" to put a new idea out there, so bully for you for starting a brand spanking new concept and raising awareness of bullying especially! I think the days of the bully are numbered, I feel a change in the tide. I am so proud of you! My brave moment was parallel with yours, we moved overseas. So many have said they never could have done what we did, in fact, the first person to get the offer turned it down, because his wife wouldn't leave their dog. It was so hard, moving there AND moving back, very very hard. BUT I would never trade all that because the rewards have been so great. I mean just saying you did a thing like this makes you feel pretty proud! Kudos and thanks for asking Steph! See you soon! Stephanie, you're a brave girl, and you don't have to care that much about what other people think! I love your Talk It Out Tuesday posts, and am really looking forward to reading these new monthly posts! My bravest moment was definitely when I moved away for a year. I was going into grade 9 (4 years ago) and I got accepted to a prestigious ballet school for the year. I was really nervous and worried, but I decided to take a chance and move away from my family to live in a dorm, go to school, and do my dance training over the border and across the continent! I came back home after that year, and though it did have its challenges, it was such an amazing and unique life experience to have had at 13 years old! You always come up with such awesome posts! I love it. And you were totally brave making that move. I don't think I could ever make a move like that on my own. Ummm... I'm finding it really hard to come up with something I've been brave about. I live life very safe and am not adventurous at all. I am proud of going back to school and getting my Master's in two years with an excellent GPA, while having a full time job and a young daughter. It was hard, but I had to have the courage to do it. Emma, that is really awesome that you had that opportunity. At 13 years old, I don't know if I would've survived. I thought I knew it all, but I was so immature, lol. Great post! Like you, I'd have to say moving was my brave moment(s). We moved cross country in 2010, and our families pretty much thought we were insane. Where we grew up, no one leaves- everyone just sorta stays there forever. My husband got a job offer and we took a chance and moved. We drove cross country in our ancient van towing a UHAUL behind it...I still don't know how we survived that drive! We loved being on the west coast and all was well until about 5 months in, my husband lost his new job. THAT was scary! It took another 6 months for him to find something new, and again- it was on the opposite side of the country (NJ). SHould we risk making another huge move like that again? NJ wasn't "Home" so it was not like we were just going back, it would be another new place, with new schools for the kids, etc etc. In the end we did move and it really worked out for the best. We are now within reasonable driving distance to our families which is huge. We had to take the opportunities as they came and it ended up working out perfectly! I've had friends tell me that they "wish they could do that" (moving) and that I was brave too (actually, spending 4 days driving cross country with 4 little boys is the most brave thing I've done now that I really think about it :-) So yeah, that would be my answer! Thank you! Wow, that's amazing! I don't think I could move overseas. That is really brave. I always want to travel overseas, but moving is a different story! I'm glad the experience was rewarding for you. Thank you Nati, you're right. Wow, that is an amazing experience I'm glad you went, it does sound scary though too. That's young to be away from home, but that sounded like a once in lifetime opportunity! I'm glad you got to experience that. Going back to get your masters is a brave move with a full time job and daughter! Congratulations on that! My mom went back to school to get her masters a few years ago, and it was a pretty courageous move for her too. That's quite the story, and that must of been difficult having to move, and then pick up and move again. I'm glad the place you're in now has worked out for you. It's good you had the experience of being somewhere else too. It's always courageous to put yourself and especially your family to into a entirely new different situation and surroundings! Great new feature, Stephanie! You're very inspiring, and I admire your commitment to discussing these very complicated issues! It's hard to be brave. For me, the biggest obstacle I've had to be brave to overcome is my Crohn's Disease, and the many challenges I've been faced with since being diagnosed when I was a child. I've had surgery many times, and that was scary. As a child I rarely felt brave, only scared. It's so hard being a sick kid! Everything is terrifying at that age. Now that I'm grown up, things are a lot easier- there are very few aspects of my disease that I can't handle and that I haven't come to terms with (although I'm still scared sometimes). I used to believe that my disease limited what I can do, and where I can go. I faced those fears when I went abroad to teach last year, spending several months (mostly alone) in a small city in Ukraine. It was scary, knowing that things could get dicey if my Crohn's decided to really flare up and that Western medicine would be a long (very, very, long!) train trip and flight away if I needed it. At the same time, I really wanted to prove that I wasn't limited by my disease. In the end, I handled everything that came my way, and I'm so happy I went there. All my doctors said I was very brave to do that, and I guess it was. Thank you for letting us share our "stories of bravery"- I'm enjoying reading everyone else's, too. This is a great feature! So excited to participate. Sadly though, I don't think I've done anything really brave....yet. I'm 22 and still live at home (but here that's more normal than in the US), I attended only one school my whole life and I've only been to one university (so far). I guess the bravest thing I did is also the stupidest really. I took a semester off from school. I realized I was just slacking and wasting my time when my heart wasn't really in it anymore, so I stopped. I worked for a while and just now went back to finish my bachelor's degree. I already applied for graduation in December so I hope everything goes well and I can finally graduate. My obstacle now is deciding what I really want to do with my life and where I'm going to continue my studies. I've never studied abroad or lived anywhere else and, although I've traveled quite a bit, I know the experience of living anywhere else will be a huge culture shock. I guess you could say I'm a little stuck at the moment but, as my friends assure me, they're all going through it so it makes me feel a little bit better. That is very brave! I know some people who have Crohn's Disease and I know how difficult and challenging that can be. It must of been hard on you especially as a child. Look where you are now, and what you've accomplished though. That's amazing, and I'm glad you're not letting Crohn's dictate how you should live your life. I think that is brave to take a semester off. It takes a lot to be able to truly re-evaluate your life and goals. That's not easy and it can be scary. It's also brave to admit you're stuck and not sure of where your life is going. There are so many people who truck through life and get things done, but are not truly happy with themselves or what they're doing. It's always good to be honest especially at your age about your uncertainty, and see where that takes you. It's totally normal and OK to feel that way. I'm only 4 years older than you ,but there are aspects of my life where I feel that way too. I think it's a part of being in our 20's. I have found at least in the US there is so much pressure to get a degree, get a job, and start a life. While those things are important, so is emotional development and finding your identity. I don't think there are a lot of resources around that support that and encourage that around for our age group. It's ok to feel stuck, and I'm sure you will find your way! I love this post idea! It's sometimes hard being a beauty blogger because we're so focused on the outer appearance and although I love everything about beauty, it's awesome to have posts like this that we can really take to heart and think about. I can't think of anything brave I've done. I think I can relate to you in the sense that I sort of let my bravery, or even just my feats, go unnoticed. What you did was extremely brave, I'm only 16 but I think it would be really hard to leave like that... such an amazing experience though too. You have the opportunity to learn for yourself and let your independence as a person kind of blossom. I think the bravest thing that I've done is probably not that brave. I'm sort of "taking a chance" on what I want to do with my life career wise. I've always had a passion for beauty like I said and soon I'm planning on going to cosmetology school. To get there though I've has to sacrifice other things and there's this nagging feeling that I've made the wrong decision. What if I fail or am just no good at this? The pressures really been getting to me. I think once I get past this I'll be so glad I did it, it's just going through the journey is when you really doubt yourself.